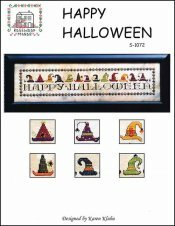 Happy Halloween [W1732] - $13.00 : Yarn Tree, Your wholesale source for cross stitch supplies. Cross stitch chart from Rosewood Manor. A yellow hat with stripes running horizontally & a spider hanging down? No, not feeling it? Ok...how about a black hat with colorful dots? Or better yet, how about a purple hat with orange dots & a spider hanging down? You have thirteen hats to choose from, "witch" one will you wear Halloween night? In addition to this large design, you can create small ornaments with these hats for a Halloween tree! "Witching," you a "Happy Halloween!" Stitch count is 258 x 54. Flax Aida 14, 60" x 1", minimum 36"